South Africa's Caster Semenya will not run in the 400m at the Rio Olympics to focus on winning gold in the 800m. There had been a suggestion she would attempt the double in Rio after winning the 400m, 800m and 1500m on the same day at the South African trials. 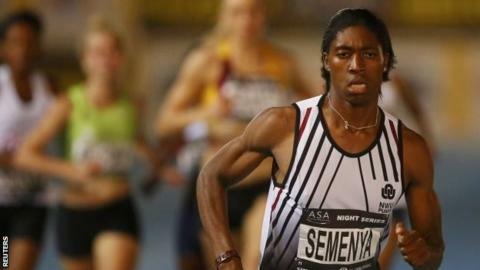 Semenya, 25, is unbeaten over 800m this season and posted a world leading time of one minute 53.33 seconds at July's Diamond League meeting in Monaco. She was subject to gender testing after winning world 800m gold in 2009. Semenya was cleared to compete by the International Association of Athletics Federations in 2010 after being sidelined for 11 months while she had tests. She won silver at the 2011 World Championships and 2012 Olympics, but she failed to qualify for last August's world final, finishing last in her semi-final in 2:03.18. Semenya has recorded three of the four fastest times in the world this year and her world-leading time lowered her personal best by more than a second. New regulations requiring female athletes to take testosterone-lowering medication if their natural levels were above the legal mark were suspended for two years by the Court of Arbitration for Sport last July.